A Chestnut is an edible nut often encased in a prickly husk and mainly grown in Spain, Italy and France. 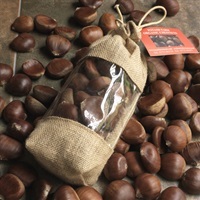 These Chestnuts have been specially selected by Potash Farm for quality size and good flavour. Storage: store in a cool dry place for up to three months. To roast: cook at 200°C / 400°F / Gas Mark 6 for 8-10 minutes, once cooked allow to stand for 2 mins and peel. 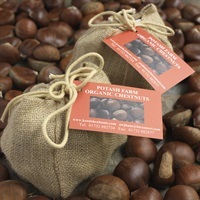 Due to popular customer demand these Chestnuts are another specialty of the Potash Farm range of gifts. Attractively presented within the bag are the Chestnuts. These make a traditional and excellent Christmas or one off gift and are available in two sizes.